Sometimes bigger is not always better! Our smaller Hot Air Balloons are perfect for occasions that are intimate and exclusive but leave a VERY big impression. We have 2 smaller Hot Air Balloons, one that takes 1-4 people and another that takes up to 8 guests. 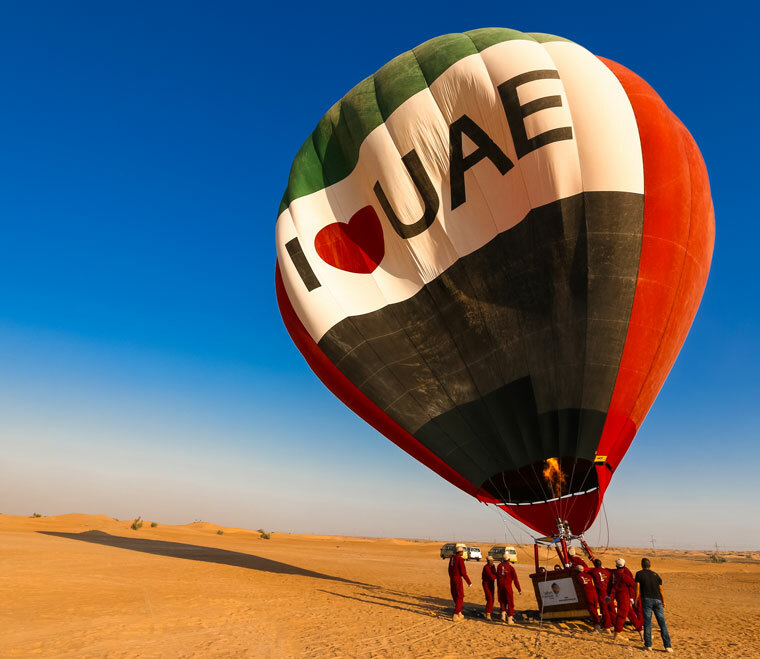 A Hot Air Balloon ride is the ultimate romantic experience, it may just be the most romantic thing to do in Dubai. We pick you up in luxury Range Rovers and whisk you out to the desert to embark on your adventure. Enjoy a one-hour flight over rolling sand dunes and a picture-perfect desert back drop. Let us know if you would like a Falconer to join you on board for a private falconry demonstration. Witness the world’s fastest animal flying around your balloon as you float over one kilometer above the Earth. Say “I love you” or “Will you Marry Me?” if you want the ultimate marriage proposal as you will be sweeping them off their feet (literally). When you come back down to earth (it may only be psychically as you will be flying high for a long time afterwards!) enjoy a private tailored breakfast (or at certain times of the year, dinner) experience with our luxury desert safari partner Platinum Heritage. This Balloon will generally fly in the morning for a sunrise experience, however as it is smaller, at certain times of the year it may be possible to do a sunset flight. Our luxury Land Rover Balloon, like all Land Rover products, exudes class. It holds up to eight friends, colleagues or business associates and is a wonderful way to entertain them as you are sure to impress. Holding only a small number of people, it will give you the privacy and exclusivity that you require. The balloon basket has built in seats and is tastefully trimmed in red leather. Whoever is on this balloon with you will know they are being spoilt, or at least treated to the luxury they deserve. Luxury Range Rovers will transport you to the take-off site. 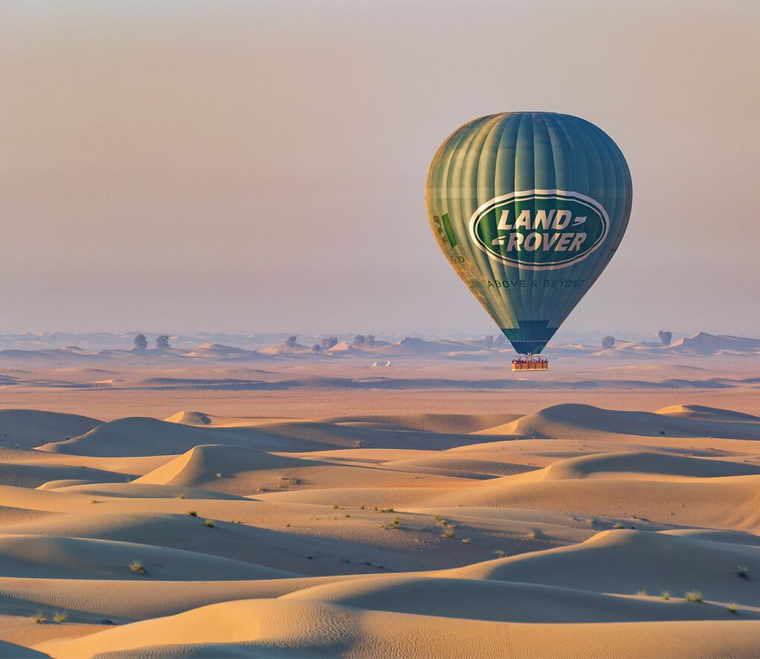 Your balloon flight will last for approximately one hour, as you spot local wildlife over the spectacular backdrop of the Dubai desert. A private falconer can accompany you to entertain you with a world exclusive event where the world’s fastest animal flies from your balloon in an amazing show. We can tailor breakfast or dinner options after the flight with our partners at Platinum Heritage.